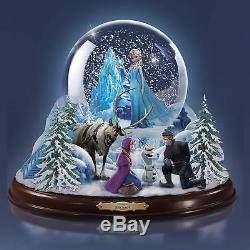 Disney FROZEN Illuminated Musical Snow-globe Officially Licensed With Handcrafted Characters, Motion, Lights And Music. Officially licensed by Disney, it is the perfect combination of lights, music and ever-swirling snow , creating a dazzling FROZEN snowglobe that perfectly captures all the heart and magic of this uplifting tale! This Disney FROZEN musical snowglobe showcases Elsa calling up a flurry of glittering snowflakes that constantly dance around her as the stunning centrepiece. Below her is a fully sculptural scene featuring Kristoff, Sven, Olaf and her sister Anna getting ready to start their life-changing quest. Each hand-cast and handpainted character helps bring the adventure to life! Plus, a touch of a switch illuminates the display with LED lights and keeps the snow in motion, while the inspirational tune of:'Let It Go' fills the air. 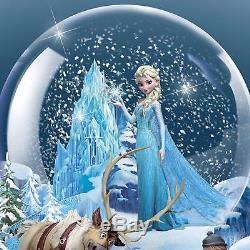 Strong demand is expected for this stunning FROZEN decoration, so don't delay. A fine collectable, not intended for children. 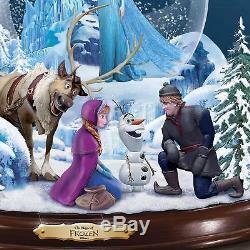 FROZEN snowglobe features fully dimensional hand-cast and handpainted character sculptures, including Elsa, Kristoff, Sven, Olaf and Anna. At the touch of a switch, LED lights illuminate the snowglobe from within and an endless flurry of glittering snowflakes dances around Elsa. Plays the inspirational tune of:'Let It Go' for the perfect finishing touch. Handsomely displayed on a mahogany-finished base with golden title plaque, making this snowglobe an elegant addition to any Disney FROZEN decoration plan. Uses 3 x'AAA' batteries (not included). Measures 7.75 inches (19.7 cm) in width x 6.75 inches (17.1 cm) in height x 7.25 inches (18.4 cm) in depth. Accompanied by a Certificate of Authenticity. Comes with our famous 365-day guarantee. 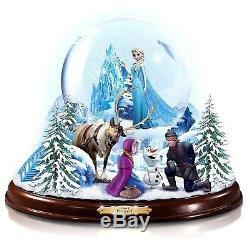 The item "Bradford Exchange Collectable Disney FROZEN Illuminated Musical Snow globe" is in sale since Saturday, November 24, 2018. This item is in the category "Collectables\Household Collectables\Snowglobes". The seller is "urbanecharm" and is located in Corby. This item can be shipped to United Kingdom, Antigua and barbuda, Austria, Belgium, Bulgaria, Croatia, Cyprus, Czech republic, Denmark, Estonia, Finland, France, Germany, Greece, Hungary, Ireland, Italy, Latvia, Lithuania, Luxembourg, Malta, Netherlands, Poland, Portugal, Romania, Slovakia, Slovenia, Spain, Sweden, Australia, United States, Canada, Brazil, Japan, New Zealand, China, Israel, Hong Kong, Norway, Indonesia, Malaysia, Mexico, Singapore, South Korea, Switzerland, Taiwan, Thailand, Bangladesh, Belize, Bermuda, Bolivia, Barbados, Brunei darussalam, Cayman islands, Dominica, Ecuador, Egypt, Guernsey, Gibraltar, Guadeloupe, Grenada, French guiana, Iceland, Jersey, Jordan, Cambodia, Saint kitts and nevis, Saint lucia, Liechtenstein, Sri lanka, Macao, Monaco, Maldives, Montserrat, Martinique, Nicaragua, Oman, Pakistan, Peru, Paraguay, Reunion, Turks and caicos islands, Aruba, Chile.